Convergent. Divergent. Analytical. Integrative. Critical Thinking. Design Thinking. It is one thing to talk about these Thinking Strategies in the abstract and even to outline a process in two-dimensional form. It is another to get right down and try out both the processes and the techniques that can support them. 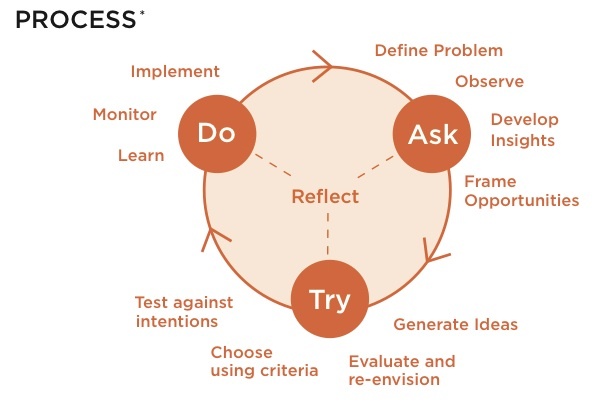 One of my design challenges that comes along with the privilege of being a member of the “core team” of the Sauder MBA is finding the time for students to dig deeper into their thinking processes. Last week it was the Zara case — which examines the very interesting and very European business model that is “just-in-time”. In other words their clothing changes every week or so, not every quarter. It is an interesting case from an operations, accounting and marketing standpoint. We took the opportunity this year to embed some process thinking into the case day. We also asked them to use two techniques – one divergent (SCAMPER from Michael Michalko’s ThinkerToys) and one convergent (Options Evaluation Matrix). We also asked them to reflect on how these worked in their thinking processes. And I asked them to diagram their proposed implementation plan — not verbalize it. All in 45 minutes. A tall order but a first step in getting beyond just talking about the processes. This also served to open up the usefulness of visual thinking and visual communications. We are now going to look closely at our classes and our cases in the MBA Core and identify the thinking strategies and techniques that we implicitly and explicitly use. We’ll do a workbook for the students that weaves all these together. I am looking forward to seeing the parts of the whole come together. All good learning for us — and hopefully for the students too. Wow Professor, great stuff! I’m looking forward to the blog on the workbook and if this still allows for a flexible thinking process. Thanks!